Are you looking for a squirrel removal service because squirrels have invaded your home? We provide humane squirrel removal in Houston, Austin, Dallas & Fort Worth. Get rid of squirrels in your house with us. Squirrels are cute little animals that generally seem harmless. They usually don’t carry any major diseases that are harmful to humans, and they aren’t aggressive. However, if they make a home for themselves inside of yours, you may want to remove them as soon as possible. A squirrel in the attic can cause a lot of problems… and they love attics. A squirrel is a small or medium-sized rodent. There are over 365 species of squirrels or squirrel-like mammals. Cartoon have done a good job of portraying squirrels accurately… they are quick, clever, and persistent little animals. Squirrels are considered pests because they chew on just about anything. Their teeth never stop growing, so their constant chewing on stuff prevents their teeth from overgrowing. Don’t be surprised if some of the “stuff” that they chew on includes your lawn furniture! They will sometimes chew through plastic or even metal to get to food! They live mainly on seeds or nuts, but will also eat insects. They’re notorious for raiding bird feeders and digging up plants, either to bury or eat seeds. They are also notorious for inhabiting sheltered areas, especially areas like your attic. This is where many problems can begin for you. Other than noise and unpleasant odors in your attic, squirrels will chew on electrical cables. This creates a fire hazard that you cannot ignore. To prevent squirrels from entering your home, you need to carefully seal your attic and basement. This will help you avoid a lot property damage caused by these little critters nesting there. Unlucky squirrels are often the cause of power outages. The animals will enter electrical transformers looking for food, then get electrocuted causing a short-circuit that knocks out power to the neighborhood. Poisoning the squirrels is generally not a good idea because of intense odor caused by a dead squirrel in your attic or wall cavity. 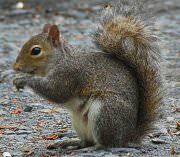 People have tried various repellents, but often the best method for getting rid of squirrels is by trapping and relocating them. If you have a squirrels in your attic or around or in your home, give us a call. We can do the squirrel removal for you. Our number is 281-961-0131.